After the death of Liesel’s younger brother on a train to Molching, Liesel arrives at the home of her new foster parents, Hans and Rosa Hubermann, distraught and withdrawn. During her time there, she is exposed to the horrors of the Nazi regime, caught between the innocence of childhood and the maturity demanded by her destructive surroundings. As the political situation in Germany deteriorates, her foster parents conceal a Jewish fist fighter named Max Vandenburg. Hans, who has developed a close relationship with Liesel, teaches her to read, first in her bedroom, then in the basement. Recognizing the power of writing and sharing the written word, Liesel not only begins to steal books that the Nazi party is looking to destroy, but also writes her own story, and shares the power of language with Max. 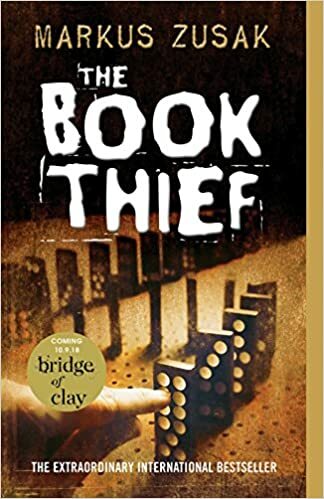 Markus Zusak is the author of I Am the Messenger, a Printz Honor Book and Los Angeles Times Book Award Finalist, and the international bestseller, The Book Thief,which has been translated into over thirty languages and has sold nine million copies around the world. He is the recipient of the Margaret A. Edwards Award for significant and lasting contribution to writing for teens and lives in Sydney, Australia, with his wife and children. With a heart full to overflowing and eyes quite moist, I finish this novel of a young waif of a girl in Hitler’s Germany whose body, soul, and spirit ought never have survived her furnace of affliction. Yet survive she does, grittily and even poetically, with the aid of a good friend, a tender father, a Jewish refugee in the basement, a mother whose harshness runs only skin keep, and a traumatized mayor’s wife who loves to have her books stolen. As the old proverb—old but still true for all its rusty years—would tell us, ‘The book is far better than the movie’. This has never been more true than with Markus Zusak’s phenomenal achievement. The book is narrated by Death, the Grim Reaper. Yet he is not an evil presence, indeed his tender observations are endearing. In the end, the circumstances of 1940s Europe keep him far busier than he’d prefer. Yet he cannot take his eyes off these dismal, glorious humans. They haunt him, these human beings do. He sees such majesty in them, and such cruelty. The circumstances that call him into hard labors allow him to peer into the human condition at its best and, simultaneously, at its best. He cannot look away from them, these horrible, beautiful, haunting beings. This reader revels in the deeply biblical substratum of this compelling novel, whether intended by its author or not. The best book I’ve read in a year. And I’m hardly alone, for this work has virtually nailed itself to the top rung of the New York Times Bestsellers List. As another old proverb might have it, 50,000,000 Elvis fans can’t be wrong. Buy it, read it, remember it when you least expect. Eleven-year-old Liesel Meminger is a foster child who has recently arrived in a small town outside Munich, Germany during WWII. Liesel has been sent to live with Hans and Rosa Huberman, presumably for the small stipend they’ll receive. Liesel is still suffering from the loss of her little brother and the difficult and somewhat mysterious separation from her mother. She takes an immediate like to Hans, who is kind and thoughtful, but takes much longer to warm up to the abrasive Rosa. Liesel makes friends with next-door neighbor Rudy and establishes herself as a self-proclaimed book thief. Becoming unlikely friends with the Mayor’s wife Ilsa affords Liesel the opportunity to read the books in the Mayor’s massive library. Along the way, Liesel is witness to the atrocities of war, heartbreaking events, love, loss and other life-changing events. I saw the movie The Book Thief several years ago and loved it. When I decided it was time to read the book I was absolutely captivated. Although the book is 550 pages long, I read it in just two days – it was THAT good. The book is different in several ways, ways in which I won’t go into in my review. Suffice it to say that I’m glad I saw the movie first and then read the book. I think I might have been disappointed with the movie version if it had happened in opposite order. This just goes to show how well the author has written this important piece of fictionalized history. The time period, location, mood, characters, etc. come to life as the story unfolds. I was surprised at some of the other reviews, stating that the book was just plain depressing. I’m not at all sure how a book that deals with the systematic extinction of a race of people can be written about in an uplifting, happy way. Yet, the book is so much more than a story about a German girl who is living in Nazi Germany during WWII. There are many lovely, tender elements to be found in The Book Thief. The additional anniversary edition footnotes written by the author (at the end of the book) provide wonderful insight. I think it’s extremely important that all generations read books like The Book Thief. This is part of history and, as poet and philosopher George Santayana said, “Those who do not remember the past are doomed to repeat it.” This is a book that is emotionally draining, but very much worth the read! I LOVED this book. We started listening to the audio version in the car before I bought the paperback. My son is an audio learner, so we are constantly looking for books to listen to. We had recently listened to another WW2 book told from a kid’s perspective. This was recommended to us, but we were warned the content was much more mature than the first book, even though it is also focused on a “child”. While that was true, it wasn’t a bad thing. I really enjoyed the narrator for the audio book, and I am quite picky. I ended up buying the paperback because I couldn’t stand to wait to see what happened since I only listened with my son in the car. I was enjoying it enough to think it was worth the purchase. I’m glad I bought it. It is “heavy” but I did fall in love with the characters and know I’ll be revisiting it again and again. One thing that I found unique about this book was that it was told from the view of “death”, or maybe a grim reaper…but it is not in any way fantasy. Looking back, I can’t imagine it being told from any other perspective and I’m so glad the author seemed to realize that too.